Asset Optimization is a performance-driven and context-based program centered around the principles of Asset Management. Projects identified as Asset Optimization are those where corridor deficiencies and performance gaps can be addressed within the existing right-of-way using lower-cost operational and capital improvement strategies that are more cost-effective and quicker to implement than higher-cost capacity expansion projects. 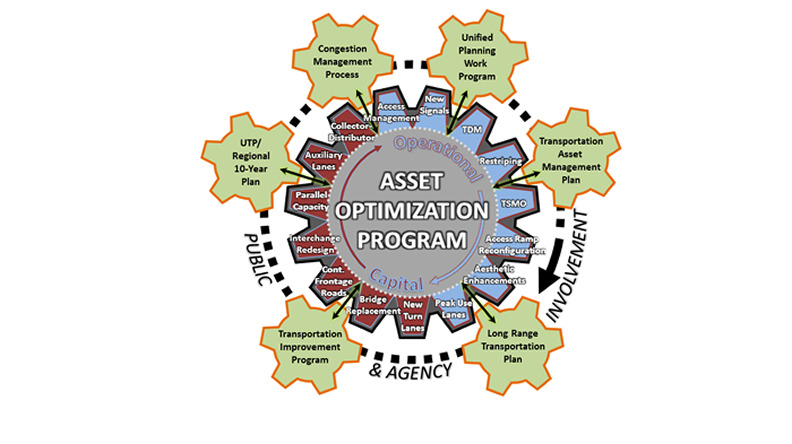 Utilizing existing plans and available data from NCTCOG program areas and partnering agencies, the potential range of Asset Optimization strategies are highlighted in the below graphic. Asset Optimization is consistent with the goals of Mobility 2045 to support travel efficiency strategies, provide timely planning and implementation, and develop cost-effective projects and programs. Asset Optimization is also consistent with the goals of the Congestion Management Process to identify quick-to-implement low-cost strategies and solutions to better operate the transportation system. Asset Optimization projects will be identified through pilot studies, bottleneck removal initiatives, and value engineering efforts in partnership with TxDOT, other transportation providers, local governments, and local stakeholders. The timing for construction and identification of other funding sources for each project will be identified in conjunction with updates to the Metropolitan Transportation Plan and modifications to the Transportation Improvement Program. 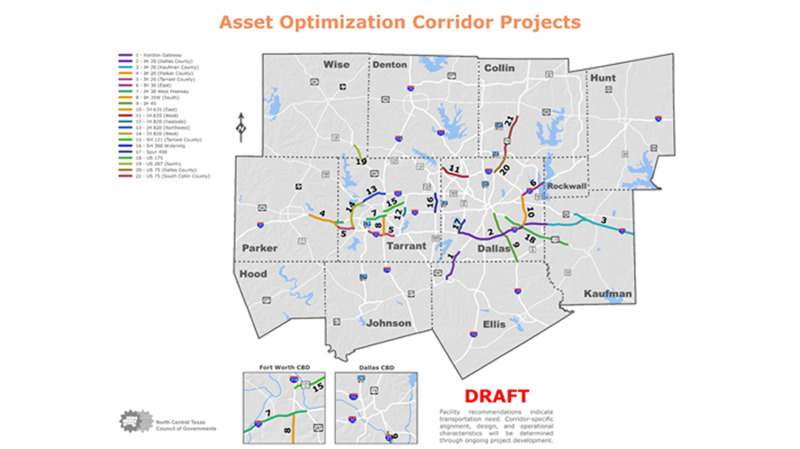 Asset Optimization principles have been recommended in several pilot projects throughout the Dallas-Fort Worth Metropolitan Planning Area as described in the Asset Optimization Project Recommendations Table and as shown in the map.